If somebody breaks into your house, are you prepared--really prepared--to defend yourself? It's late at night. Those quiet, hollow hours when you and your family are asleep. Everything should be calm, serene, safe. But then you hear a bump, a creak outside your back door. It crashes open, and you are jostled awake with the realization that someone who shouldn't be there is inside your home. With fog-shrouded brain and unfocused eyes, you fumble for the handgun in your bedside drawer as a shadowy figure appears in the hallway. You're holding the pistol with sweaty palms and a shaky grip. Is the gun cocked? Can you see the sights? Should you shoot? This is the dilemma faced by any law-abiding citizen on the brink of becoming a victim in his own home. And in today's crime-infested society, although a man's home may still be his castle, there are too many people trying to swim the moat and storm the turrets. So how do you keep the drawbridge up? By using preparedness and mental conditioning as your armor. For example, it is all well and proper to practice with your handgun at the range and be able to place all six or seven or 13 rounds into a silhouette target. But what if that target was made of flesh and blood rather than cardboard-backed paper and was intent upon breaking and entering your home? To be effective, practical handgun usage for home defense calls for practical thinking and training because, unlike missing the 10 ring at the range, in real life you may not get a second chance to reload and try again until you get it right. You must be mentally prepared to quickly and effectively react to an unexpected threat in your home. "The first step is to separate yourself from the sheep in the herd and turn into a sheepdog," says Ed Head, operations manager for Gunsite Academy (gunsite.com). Prior to joining Gunsite in 1991, Head served four years in the U.S. Air Force doing nuclear weapons security and spent 24 years with the California Border Patrol. "As [Gunsite founder] Col. Jeff Cooper often said, it has nothing to do with the amount of danger you're in but has everything to do with your ability to respond." Gunsite's philosophy is to use levels of awareness as a means of controlling stress because once you control stress, you're better able to control your gun and the situation. The highest level of awareness, Condition Red, is the one you're going to be in when that shadowy figure in your home is positively identified as a threat. Law enforcement vet Larry Mudgett stresses rehearsal and also keeping your wits about you to avoid making bad judgment calls. "Red doesn't necessarily mean you're going to be in a fight, but you should have already made your decision based upon mental rehearsal," Head says. That means you must have a plan of action for something that hasn't--and may never--occur. If this sounds paranoid, consider that a favorite pastime of police officers is spending hours discussing "what if" scenarios with their partners. Thinking through scenarios and discussing them with family members could be the difference between becoming a victim or taking control. "But the problem with 'what if' scenarios is that there are infinite variables," says Larry Mudgett, an LAPD officer for 35 years and a member of the city's SWAT team for 14 years, during which time he was a firearms and hostage rescue instructor. In addition, he served as an infantry sergeant in the 1st Air Cavalry in Vietnam. "Changing one factor can completely change the appropriate response. "You must first be familiar with the laws in your city and state. Then you must consider different possibilities and construct a plan to respond to each. Every member of the household should know what their assignment is in such an emergency. "Rehearsals decrease reaction time. For example, what do you do if there is a prowler in your yard or on your porch? First, be prepared to defend yourself should the scenario suddenly change. When practical, call 911. For former Army Ranger Tim Abell, if the situation calls for deadly force, there's no substitute for being intimately familiar with your chosen gun. "Keep in mind that prowling is usually considered a low-grade misdemeanor. Attempting to arrest the prowler would not normally be advised. Deadly force will not be lawful if there is no other threat. "Never believe the old wives' tale about shooting the prowler and then dragging him inside. If you believe this nonsense, you better stand by for a long stretch in prison. If you think that today's scientific investigators are not going to know what happened and be able to prove it in court, you are not paying attention. Besides, why do you need to shoot a prowler when he is outside and you are inside?" As for someone sneaking around the house at night, Head recommends staying inside, arming yourself, dialing 911, then waiting for the police to show up. And stay on the phone with the 911 or police operator. "The call is being recorded," says Head, "and you want everything you say--such as 'Stop. Don't come any closer or I will shoot'--on tape. Gunsite's Ed Head thinks awareness and preparedness are keys to dealing with intruders, and that preparedness goes well beyond just gun proficiency. "Whether a bad guy is inside or outside, when the police show up and ask you to open the door, ask the 911 operator for their names. Then ask the officers for their names. If they confirm, then tell them you are armed, tell them where you think the bad guys are and ask them what they want you to do. "Follow their instructions, and don't get indignant if they point a gun at you, put you on the floor, or handcuff you. Remember that you asked them to come to your home. Once they get there, they--not you--are completely in charge. They are going to do what they believe they must until they manage to get everyone identified and feel the scene is safe." Head has another tip, which is to have a house key attached to a chemical light or flashing LED light. Tell the 911 operator where you are--the northwest corner of the house, for example--and when the officers respond, tell them you will throw a house key out the window so they can let themselves in. If bad guys are still in the house, this keeps you from having to go to the door and keeps the officers from having to kick it in or find a way inside. To make this scenario work, Head recommends keeping your cell phone in the bedroom at night. That way, even if a bad guy disables the phones--all he has to do if he's inside the house is pick up an extension--you're still able to phone the cops. And then there is the dilemma of how and where to keep a home defense handgun. Mudgett believes in wearing one all the time, whenever legal and physically possible. "The idea that you are going to have the opportunity to go and find your gun when residential robbers have already kicked your door down is silly," he says. "I can recall numerous cases where an officer has been murdered or assaulted in his own home, while the sidearm he should have been wearing remained just out of reach." Most people wouldn't find that to be practical. The alternative to this strategy would be to stash guns in various locations around the house where they could be easily accessed no matter where you were when an intruder entered your home. But having an openly visible or easily accessible firearms isn't always the safe or prudent thing to do. "With kids in the house or if there are others who don't shoot or who cannot be trusted, keep the gun in an easily accessible--to you only--gun safe," says Head. "Or keep the pistol, unloaded, up on a shelf and carry the only available magazine on your person. Anyone finding the gun can't make it fire, but you can load it in seconds. "But children who are old enough and spouses must be taught the basics of firearms safety and handling--even if they have no interest in shooting--lest they find themselves in a situation where a gun is present and someone is mishandling it." But what if your "significant other" wants no part of handguns? "People are naturally afraid of that which they do not understand," says Mudgett. "If your spouse has been brainwashed by the anti-gun news media to believe that guns are evil, educate her. Get her a book on the subject. If she is not an avid reader, get her a DVD on gun safety. Start slow and build on the progress. Once you get her into a basic shooting course and she learns how much fun and how safe shooting can be, you will have a convert." Being intimately familiar with whichever handgun you choose for home defense is critical to being able to use it effectively. No one knows this better than Tim Abell, an ex-Army Airborne Ranger and now a successful Hollywood actor who has appeared in such films as "We Were Soldiers" and currently appears on the CBS series "NCIS" and hosts "Grateful Nation" on ESPN2. During his tour of duty, Abell convinced his commanding officers to let him carry the non-issue Colt Lightweight Combat Commander he had owned since he was 14 years old. The reason? He knew the gun and was extremely proficient with it. Today, however, he uses a Glock 30 as his home defense gun. Mudgett also favors the .45 ACP for personal defense, and he likes the manual safety and crisp trigger pull of a 1911. He also used Glocks and Smith & Wesson semiautos on duty and found them all to be accurate and reliable. He even feels perfectly comfortable with his Ruger New Vaquero, as he has taken the time to learn to shoot defensively with it. "Everybody wants a cool handgun like a Glock, SIG or Beretta," says Abell. "But it's a commitment to have a handgun in the house, especially if you have a wife and kids. So what is your commitment to having this gun? 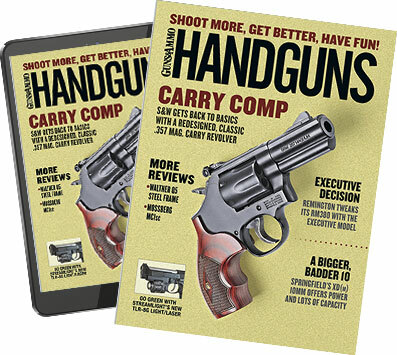 Are you planning on attending a course and taking instruction from a professional who can give you the proper information on how to carry, clean and shoot that handgun? It's not a one-time thing. It involves going out at least once a month to re-qualify yourself with your weapon at the range." "The mindset I have is this: I'm the first line of defense for my family. If I break down, then that person who's in the house can do whatever they want to my family or myself. And that's unacceptable."